The Ideal Solution For Missing Teeth? Dental Implants in Newark! Unfortunately, there are countless reasons for tooth loss. Gum disease, accidents, heredity, and poor hygiene are just some of them. It’s no wonder that an estimated 178 million Americans are missing at least one of their teeth! But, while there are a lot of reasons behind tooth loss, there aren’t nearly as many solutions. In fact, there are only three main choices for replacing missing teeth: dentures, bridges and dental implants in Newark. Find out why implants are such a great solution and what the process is like in this blog! Why Are Implants the Ideal Solution For Missing Teeth? Implants do one thing that other options don’t: They replace the roots of missing teeth. In fact, an implant on its own is only the titanium post in the jaw that acts as a root. Once it’s fully healed and fused with the surrounding bone, a crown, bridge or denture is attached to complete the restoration. Why is replacing the root so important? There are a couple of reasons: First, it tricks your body into thinking that a tooth is still present, so the jawbone won’t shrink over time. Second, a root is the foundation of a tooth’s chewing strength, so replacing it results in unmatched stability and longevity. What Advantages Do Implants Offer Over Dentures or Bridges? They look, feel and function more like your own teeth. You won’t lose bone mass in your jaw over time, so your facial structure and appearance won’t change the way it can with dentures. Implants last decades with basic care and maintenance, much longer than dentures or bridges. You won’t have to worry about embarrassing slips during conversations like you might with dentures. Implants don’t negatively impact the adjacent teeth the way bridges do. You’ll have dramatically better chewing strength so you can still eat your favorite foods. Implants require a small, in-office surgery with a dentist in Newark that usually takes around two hours. This is a lot easier than most people expect! First, you’ll be numbed so that you’re completely comfortable. Then the implant will be placed in the jaw, which will cause some mild discomfort in the area for a week or two. In most cases, over-the-counter pain medication manages it very well. 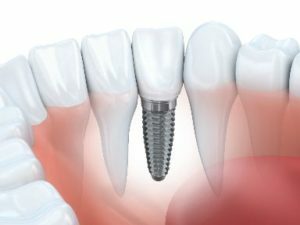 Then, the implant is given between 3-6 months to integrate, or fuse, with your existing jawbone. You won’t have any discomfort during this time and can eat and function normally. Finally, a crown, bridge or denture will be made that matches the rest of your smile. After it’s attached to the implant, the process is complete. It’s also important to note that some patients may need a bone graft prior to getting an implant if they don’t already have enough bone mass to support it. Examples include patients with developmental defects, gum disease, or facial injuries. Implants are a marvel of modern dentistry. In fact, they look and feel so great that you may forget you ever lost any teeth to begin with! With many years of experience as a dentist in Newark, Dr. Timothy Ganfield has used dental implants to restore the smiles and self-confidence of countless patients who have lost teeth. If you’re trying to decide which replacement option is best for you and have additional questions, he can be reached via his website or at (302) 731-4225. Comments Off on The Ideal Solution For Missing Teeth? Dental Implants in Newark!